On the other hand, the Lagos State government wasted no time in defending its actions by stating that it held meetings with the leadership of the market where an agreement was reached to relocate the traders to Isopakodowo market in Bolade-Oshodi. And even projected its human face by allowing the traders pay a paltry N5,000 monthly as rent for the new market; which is said to boast of bigger stores and is generally a befitting alternative for the traders. Government also claims to have issued a quit notice to the traders before moving in to carry out the demolition that fateful morning. What is not clear is whether the representatives of the traders who held a meeting with executive committee members of the State government communicated the decision reached at the meeting with their members. As is with any matter that affects the livelihood of the masses (even if temporarily), the events of the wee hours of last Wednesday has unsurprisingly elicited many sentimental responses to the action of the government. Some people have even gone on a tangent to declare the move as tribal, since many of the traders are of Igbo origin. It is worthy of note that this is only the second time in six years that the state government will be embarking on major developmental work in Oshodi. The first being the immediate past governor of the state, Babatunde Fashola’s efforts in 2009, which transformed the highly notorious area; infamously known to be the hotbed of all criminal and nefarious activities, as well as one of the filthiest parts of Lagos into a much better place with a far less threatening aura. Nevertheless, I for one have never believed that it was all uhuru in Oshodi, especially after the early days that followed the change in government. A regular commuter on that route, particularly at night can hardly miss the gradual return of impunity and traffic gridlock in the area, and more worrying, the growing number of street urchins and miscreants who constantly harass motorists and passersby. At the height of their resurgence, touts and hoodlums brazenly robbed motorists daily by smashing the side glass of their cars, inflicting injury on some of them in the process. And so, when the Commissioner for Information and Strategy, Mr Steve Ayorinde, stated that the main reason the government decided to pull down the market structure was to secure the lives and properties of the residents and the general populace. Divulging further that weapons were found in bunkers within the market, I had no cause to doubt what he said. Oshodi is one part of Lagos which by default has the propensity to erupt in violence at any time. What with the ever present cult gangs whose constant battle for supremacy ensures that a full blown mayhem is only a hair’s breath away from simmering to the surface. The plan to construct an ultra modern bus terminal complete with the full complements of a standard bus shelter in line with the bigger picture of getting Lagos to the enviable status of living up to its potential of becoming a mega city in the mold of New York or Johannesburg is laudable. Having stated that, when it comes to matters that hugely affect the livelihood of the common man, it is difficult to hold a strait-laced view devoid of sentiments. The truth is that anyone who’s directly or indirectly (particularly those who have done legitimate business there for many years) affected by the demolition would hardly be in the right frame of mind to reason with the government regardless of its noble intentions. A situation where the traders were given ample time to sort themselves out would have been ideal. A notice of three weeks or thereabout is not nearly enough for someone who has occupied a particular place for a long time to shift base. Government can rightly state that it has provided an alternative for the traders, but the said alternative was only being renovated after the former base of the traders had been demolished. All renovations and logistics involved in moving the traders should have been taken care of before the demolition. A good number of us clamoured for change from the status quo. It’s important to accept that there is no change that comes without some form of discomfort. Paraphrasing the popular saying: It is foolhardy to do things the same way, and expect a different a result. Any significant progress that is made in life; be it the life of an individual, corporate body or state/country will most likely come with some degree of discomfort or adjustment. The construction of the road in my part of town resulted in several fences and shops being earmarked for demolition (and subsequently demolished) in order to give way for the expansion of the road. Many of us were affected. And though it was a less than amusing situation at the time given that affected residents had to find ways to cough out money hitherto not budgeted for to reconstruct fences and shops. At the end of the day, most agreed (albeit grudgingly) that it was for the greater good of all. Today, even though the road construction is yet to be fully completed, there’s a huge difference between what used to obtain plying that route and the reprieve everyone can feel now. There really is no gain without pain. Change should hardly be defined by a slogan we chant every now and then without fully grasping its import and application to our daily lives. At the end of the day, any action taken in the interest of the larger populace trumps any individual or group interests in any part of the world. And that’s the way it should be. P.S: The Lassa Fever Epidemic is spreading by the day in Nigeria. Please keep all food stuff away from rats, and ensure a generally clean and hygienic environment. I agree absolutely with the push for development. However, more time should have been given to the traders to move. It is also quite obvious that this low blow was struck when most of the traders were away celebrating a new year. Furthermore ..being away robbed them of the opportunity of salvaging anything. This is essentially evil of the government. Lagos is having a lot of pressing issues at the moment, traffic is horrific…our roads are abominable and this happens to be the priority of all the ills plaguing Lagos. Something is wrong somewhere. The residents of Okota have experienced he’ll in the last two months from the hands of some charlatans parading as a construction company….. I can feel how passionate you are about the subject matter. 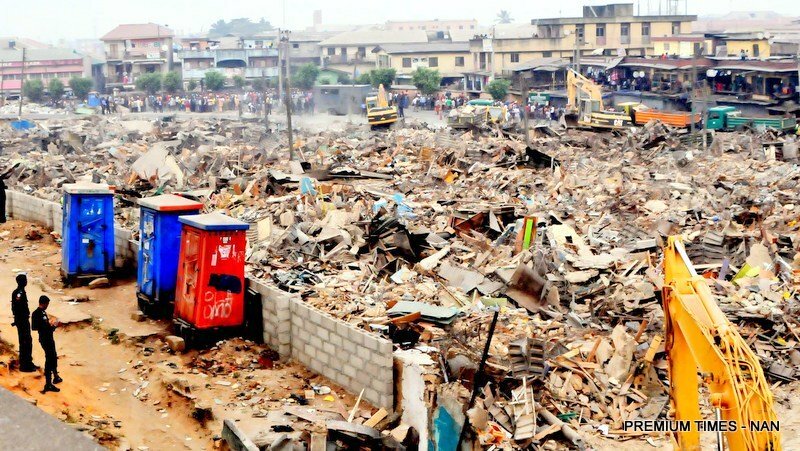 There are conflicting reports about the trader’s goods being destroyed or not, as some have said they had moved their goods way before the demolition was carried out. I can see some semblance of a focused government in the Ambode administration. Let’s keep our crossed that things will get better. Thank you so much for commenting. I don’t know if it’s me or Lagos is gradually turning out to be an elitist society where the common man is struggling to survive more than ever. It’s as though the government is encroaching into commercial hubs for the sake of making Lagos that mega city. They might be relocating the traders but truth it is not convenient for the buyers. I was told of Computer Village relocating to Sango Otta. If that is true, the Lagos State government might be making a big mistake regardless of its development agenda. Computer Village is one of the biggest business districts in Africa generating tons in dollar value yearly. Could anything really bring more money for the government? The relocation to Sango Otta is so outrageous because one, the distance and two, the bad roads on getting to that place especially Ebule Egba and three, traffic. Ikeja is central and no better place for Computer Village than there. It’s good for Lagos to become a megacity, it already is in my opinion but somethings need to remain untouched. Just like you wouldnt demolish the national arts theatre simply because theatre has lost its touch in Nigeria. No way. This is first time I am hearing about the plan to move Computer Village to Sango Ota, and I really doubt if that’s true. For one, Sango is in Ogun State and it would amount to a huge revenue loss for such a money spinner to be moved outside the commercial centre of NIgeria. Oshodi again,there’s one question I’d like to ask however,why does the government enjoy to catch these traders unawares?I’d really like an answer to that question however,a change from the status quo is always highly needed in that part of the town as it always remains a volatile area and maybe,just maybe oshodi can be transformed to a suburb beyond our wildest dreams,nice one Lolo. Lol, Oshodi is special. I think it was a calculated move by the government to do things the way they did. I really believe they could have handled it better. But, that’s just wishful thinking now. What’s done is done. Thanks bro. I think the government should be sympathetic to the plight of the masses, it is not at this period that they will be demolishing shops, the economy is bad, where do they want the traders to start from, this is disheartening,I am really sentimental about the plight of the traders,this is not fair at all,some of them borrowed money to start their business, while some of them are sole breadwinners who derive their income solely on the money they make from their business. My problem with Lagos state government is that they claim that they have made adequate provision for new shops for the traders, you will find out that is a lie and that those new shops were actually meant for their own people. They should remember there is God in everything they do,It is just not fair. That’s exactly my grouse with the Lagos State Government- The fact that the new site for the traders is actually not particularly ready for them to move into. Let’s just hope they speed up the renovation.Thanks Mayowa.